Beer and Hymns – This Sunday! Come join in this joyous experience and help your neighbor at the same time! 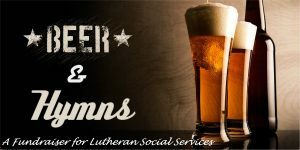 This Sunday, April 22, retired Lutheran Pastor Dan Bollerud presents 2018’s first “Beer and Hymns” in Anchorage. A wonderfully social and spiritual event, it has raised $63,000 over the past four-years. These funds have gone to Lutheran Social Services of Alaska (LSSA), which provides a panoply of services to Alaskans. Most importantly, LSSA’s Food Pantry supplies thousands of Alaskans with needed nutrition. Pastor Dan hopes this Sunday’s event will raise over $7,000 to push the four-year total over $70,000. There is incredible comradeship in singing hymns, dining together, and experiencing the joys of Christian fellowship. Jamie Berge’s masterful piano playing, along with Pastor Dan’s rich baritone, compel enthusiastic audience participation. Oh, by the way, these hymns are not sung mournfully as some local churches often do, but with an up-tempo spirit and richness they rightfully deserve. There is intense competition among those present to request their favorite hymns. Everyone is accommodated. Mo’s O’Brady’s Restaurant in the Huffman Business Park next to Carr’s Huffman is hosting this Beer and Hymns once again. There is no admission. An LSSA representative will be present to accept donations via check, cash or a card reader, and to answer your questions about their services. At the last Beer and Hymns, over $11,000 was raised in the two-hour event. I plan on being there as well. If you’d like to discuss issues regarding local churches, seek me out. The event starts at 6 p.m. and concludes promptly at 8 p.m. Spiritual highs are no-charge. My hat is off to the generosity of local Christians of virtually every faith who support this awesome event! This entry was posted in Church Visits Blog and tagged Beer & Hymns, LSSA, Lutheran, Rev Dan Bollerud on April 18, 2018 by Chris Thompson. Easter 2018 – He is Risen! Rejoice! At Easter time, I love to perennially share the beautiful N.T. Wright quote from his book “Surprised by Hope” for it inspires a true re-examination of the way we celebrate Easter. Finally, I conclude with theologian Walter Brueggemann’s Easter poem. I wish you joyous Easter greetings, HE IS RISEN! This entry was posted in Church Visits Blog and tagged Easter, NT Wright, Walter Brueggemann on April 1, 2018 by Chris Thompson.